Al Shorta were invited to play in the 1983 edition of the President's Gold Cup, which took place in August and September of that year in Dhaka, Bangladesh. 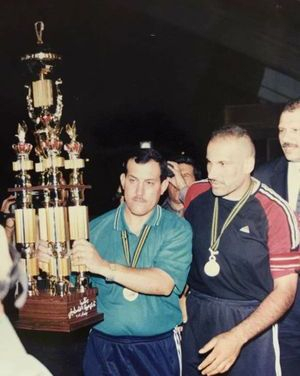 The Police won the tournament, which remains the only competition Al Shorta have won that contained teams from all around the world, rather than a select region such as Asia or the Arab world. There were two groups of five in the tournament, Group X and Group Y. Al Shorta were placed into the latter with South Korea XI, Bangladesh Red, Thailand national team and Nepal national team. Group X consisted of Malaysia national team, Middlesex Wanderers (an English club), India B national team, Jilin (a Chinese club) and Bangladesh Green. Al Shorta's first game was against South Korea XI on 30/08/1983 and they drew the game 1-1. Five days later, Al Shorta went up against Thailand's national team, and against many people's expectations, defeated them in an emphatic 4-2 victory with midfielder Karim Nafea scoring a great long range goal. Al Shorta faced the national team of Nepal next, and once again won the game very comfortably; it ended 3-0 to the Police. A 0-0 draw against Bangladesh Red followed but it was enough to send them to the semi-finals. Group Y finished with Al Shorta on top with six points (each win counted for two points), South Korea XI behind them in second, Bangladesh Red in third, Thailand in fourth and Nepal at the bottom. In the semis, Al Shorta faced the only English team in the tournament, Middlesex Wanderers, on 08/09/1983. Middlesex Wanderers had finished in second place in their group behind Malaysia. A pulsating encounter finished in a 2-2 draw which meant that penalties would decide who would face Malaysia in the final, who had defeated South Korea XI 3-2 in the other semi-final which took place a couple of days before Al Shorta's semi. The penalty shootout ended in a 4-3 victory for the Police, sending them to the final against Malaysia. Surprisingly, and unfairly, the final took place only a day after Al Shorta's hard-earned victory over English opposition. However, the fatigue of the Al Shorta players did not affect the result as Al Shorta went on to comfortably win the final 2-0 against Malaysia and win the President's Gold Cup. The Malaysians had no answer to the speedy display of the Iraqi side, with Nasir Jasem's 18th-minute goal opening the scoring and Adnan Khatom sealing the cup on 70 minutes. Al Shorta midfielder Karim Nafea won the top scorer award for the tournament. It was the only time Al Shorta participated in the tournament, and they certainly did themselves proud. In August 1986, Al Shorta participated in a tournament hosted in Baghdad containing teams from all around the world including Iraq, Brazil, Kenya, Jordan, Morocco and Kuwait. The tournament was called the 'Saddam International Tournament' and consisted of two five-team groups; Al Shorta were drawn into Group 2 with Al Rasheed and Al Zawraa of Iraq, Wydad Casablanca of Morocco and Al Fahaheel of Kuwait. Al Shorta's squad consisted of the likes of Wasafi Jabbar, Munther Nadhim, Ali Rustam, Muwafaq Hussein, Mohammed Khalaf, Saeed Nouri, Ali Mohsen, Riyadh Abdul-Abbas, Tariq Abdul-Amir, Khamis Hamoud and Faisal Aziz. They started their tournament with a 4-0 win over Wydad Casablanca on 16/08/1986, thanks to goals from Saeed Nouri, Mohammed Khalaf, Ali Mohsen and Ali Rustam (Mohammed Khalaf's goal was a penalty, pictured above). Two days later, Al Shorta played out a 2-2 draw with eventual winners of the tournament, Al Rasheed. Al Shorta's third group game was a disappointing 2-0 defeat to Al Zawraa with two goals from Adnan Hamad (the first being an open-goal tap-in and the second being a calm left-footed finish). This result meant that Al Shorta would have to defeat Al Fahaheel by two goals in their final group game in order to qualify for the semi-finals. Al Shorta did beat Al Fahaheel, but unfortunately the Police won the game by just one goal as opposed to two. The final score was 2-1 to Al Shorta with the Iraqi side's goals coming from Faisal Aziz and Saeed Nouri. Al Shorta finished third in their group with five points (each win counted for two points as opposed to three), two points behind group leaders Al Rasheed and just one goal behind Al Zawraa, and therefore failed to reach the semi-finals. The tournament was eventually won by Al Rasheed, who qualified for the 1986 Al Muthabara Cup in which they were also victorious. 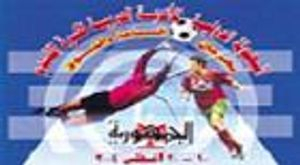 Five days after Al Shorta won the 2002 Iraqi Elite Cup, they kicked off their successful campaign in the 2002 Al Quds International Championship and eventually won the tournament. Al Shorta were drawn into Group B alongside Omyyah of Syria, Itehad Al Shejaeea of Palestine and Al Baqa'a of Jordan. Al Shorta started with a 2-1 win over Omyyah. Ammar Ahmad opened the scoring on five minutes and just two minutes later, Ahmad Mnajid scored a penalty to put the Police 2-0 up. Hazem Harba got a goal back for Omyyah on 64 minutes but Al Shorta ended up with the three points. Al Shorta's next game was a comfortable 3-0 thrashing of Al Baqa'a. Goals from Tassyer Abdulhussein, Faris Abdul-Sattar and Ammar Ahmad on 25, 28 and 80 minutes respectively won the game for Al Shorta and ensured that they got the three points. Al Shorta's last group game was another easy 3-0 victory, but this time it was against Itehad Al Shejaeea. Ayad Abbas opened the scoring on 45 minutes with a trademark penalty and Ammar Ahmad scored his third goal in three games in the tournament on 60 minutes. Mohanad Mohammed Ali scored in the last minute to secure a great win for Al Shorta. Al Shorta finished top of the group with nine points, ahead of Omyyah who earned six points, Itehad Al Shajaeea who earned three and Al Baqa'a who failed to earn a point. This meant that Al Shorta had qualified to the semi-final and would face Baghdad rivals Al Quwa Al Jawiya, the winners of Group A. Al Shorta won the game 2-1. Munaim Yousef scored a penalty for Al Shorta on 30 minutes before Al Quwa Al Jawiya equalised with a penalty of their own, scored by Hadi Jaber on 47 minutes. Ammar Abdulhussein scored the winning goal for the Police on 75 minutes to secure a place in the 2002 Al Quds International Championship final. Iraqi club Al Najaf were Al Shorta's opponents, and Al Najaf had thrashed Omyyah 4-1 in their semi-final game to reach this stage. This was the perfect opportunity for Al Shorta to exact their revenge on Al Najaf, who had inflicted defeats on Al Shorta in both the 1992 Al Nasr Wal Salam Cup final and the 1997 Iraqi Elite Cup final. And Al Shorta duly did so, coming out victorious on 8 September thanks to Ahmed Hussein Adan's goal on 65 minutes. Al Shorta had written their name into the history books by winning an international club competition once again. Al Shorta were invited to take part in the 2004 Algomhuria International Cup, which was to be hosted in Alexandria in Egypt in August 2004. Participating in this tournament were eight teams, meaning that the format of the tournament was two groups of four, with the winner of each group playing in the final and the second-placed team of each group facing off in a third-place playoff. Group A consisted of Al Zamalek, Al Shorta, Al Sharjah and Al Shabab, whilst Group B included Al Olymbiy, Al Ittihad Al Sakandary, Al Akhdhar and Al Ansar. Al Shorta, donning a purple strip, kicked off their tournament against the favourites of the competition, Egyptian club Al Zamalek. Most people expected Al Shorta to lose the game, but they drew 1-1. Ahmad Saleh opened the scoring for Al Zamalek just two minutes into the tie and many expected more goals to come. But thirteen minutes later, Ammar Abdulhussein equalised with a great penalty that was won by Hashim Ridha. Al Shorta missed a one-on-one chance but were still controlling the midfield; their defence was very solid, especially with Maher Habeeb playing at his best. Maher and Al Shorta's 'keeper were saving their team with some fine tackles and saves. Up front, Tassyer Abdulhussein and Hashim Ridha were looking very deadly, but near the end of the match Al Shorta had to defend to keep the draw which they did very well. Most fans agreed that it was a great result for Al Shorta. Al Shorta's next game was against the worst side in the tournament, Kuwaiti club Al Shabab. Because Al Zamalek drew their game against Al Sharjah, Al Shorta would go to the top of the group with a win here. And they did win very comfortably with a 4-0 demolition of Al Shabab. Legendary striker Hashim Ridha scored the first two goals of the game in the 12th and 40th minutes, with Haitham Kadhem making it 3-0 on 47 minutes. Forward Bashar Saad completed the rout with the fourth and final goal on 78 minutes to put Al Shorta top of Group A.
Al Shorta's final group game was against Al Sharjah of the United Arab Emirates. Al Zamalek had defeated Al Shabab 7-0, meaning that Al Shorta had to defeat Al Sharjah to reach the final. A loss would see them finish one point behind Al Zamalek, whereas a draw would see them finish behind Al Zamalek on goal difference, so they had to win. Al Sharjah took the lead against the Police and it was 1-0 to them at half-time. Al Shorta weren't playing too well at this point, but they gradually improved and equalised on 73 minutes through Ammar Abdulhussein's goal. Al Sharjah took the lead once more leaving Al Shorta with the difficult task of having to score two goals to reach the final. Al Shorta did score an equaliser in the 94th minute of the match through Ammar Ahmad, but it was too late to win the game and the result meant that Al Shorta were to play in the third-place playoff. Al Shorta's manager Younis Abid Ali was pictured crying on the pitch, which showed how much he cared about the club and how passionate he was. Group A ended with Al Zamalek in first place with five points and +7 goal difference. Al Shorta were in second with five points and +4 goal difference, and Al Sharjah finished third with five points and +3 goal difference. Al Shabab were bottom with no goals scored and fourteen conceded. Group B finished with Egyptian team Al Olymbiy at the top with seven points, and Egyptian club Al Ittihad Al Sakandary in second with four points. Libyan club Al Akhdhar finished in third with three points and -2 goal difference, with Saudi Arabian side Al Ansar finishing bottom with three points and -3 goal difference. This meant that Al Shorta were to face Al Ittihad Al Sakandary in the third-place playoff. After an exhilarating match that ended 3-3 after extra time, there was a penalty shootout to decide who would finish in third place. Unfortunately for the Police, they were defeated 6-4 in the shootout and they had finished in fourth place in the tournament. The eventual winners of the tournament were Al Zamalek, who beat Al Olymbiy 3-2 in the final. The player of the tournament was Al Shorta's Iraqi player Haitham Kadhem, who most pundits and fans agreed deserved his award. Al Shorta didn't win the tournament, but it certainly made Al Shorta and their players more recognised in Asia, and especially Egypt, who hosted the tournament. Egyptian clubs were reportedly interested in some Al Shorta players after the competition, with rumours at the time suggesting that Hashim Ridha was wanted by Al Ahly, Maher Habeeb was wanted by Al Terasanah and Tassyer Abdulhussein was wanted by ENPPI. It was a good tournament for Al Shorta overall, and a fourth place finish was very respectable.